Posted by Jonny Greenwood on 11/21/2018 4:44:58 PM. What's the principal difference between an eBook and a paper book? eBook is much cheaper and easy to carry, and you can carry thousands of ebooks in one device which is even lighter than a single paper book. You can organize them pretty well as the title, genre, and authors and read them whenever you are on a beach or a train. However there are still many people who like the feel of the tangible paper and the smell of ink, and in many occasions the paper books indeed get advantages over eBooks. So rather than buying an expensive paper book, why not just print the eBooks to paper? Maybe you just need to print pages from Kindle book instead of the entire one. In this occasion, only printing the part you need is obviously the best choice for you. But can you print out kindle books? 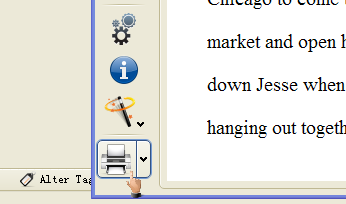 The answer seems no, as there is not any "Print" button in the Kindle books reader software "Kindle for PC/Mac". Keep calm, we have already found a solid solution to make Kindle books be printed. Therefore here we mainly discuss how to print Kindle eBooks out to paper books. There are two obstacles for printing a Kindle azw book out: Amazon locks the printing feature with DRM, and there is no "Print" button in the Amazon book reader software Kindle for PC. Now all these two issues will be solved here. By the way, before I write this post, I searched internet to see if anyone has got some brilliant ideas, and the results do surprise me. There are so many pages telling you to open Kindle for PC, then take the screenshot page by page. Are you kidding me? If I want to print a Kindle book which has 300 pages, I think I have to spend an entire day to do this boring job, oops, one page is missing, then I have to check which page do I miss out. To take screenshots then print them out is absolutely a ridiculous idea I promise you. Let's back on track, read the following paragraphs to learn how to get your Kindle books printed in 10 minutes. Let's talk this in straightforward way. You must strip the Kindle DRM to make it possible to print your book out. Because DRM protection limits how many pages(5-20 pages in general) you can print or even doesn't allow you to print it at all. Please attention, this is what you must do if you want to print a Kindle book to paper book. Only by making this Kindle book DRM-free, you can convert it to ePub or PDF then print it out. As the reader software "Kindle for PC" doesn't provide a print button, you need to convert it to ePub or PDF and read it in Adobe Digital Editions which has got a print feature. Updated on April 10, 2013: New version of Adobe Digital Edition v 2.0 had already removed the print feature. If you need to print the book, please use the old version v 1.7, or use another tool Calibre. Epubor Ultimate can convert purchased Kindle books to ePub or PDF within one click. Click the button below and you can get a 30 days free-trial. As explained in the paragraph above, new version of Adobe Digital Editions doesn't support print function any more, so we recommend you use Calibre to print books out. After loading the book into Calibre, double click the item name to read it by Calibre built-in reader, then you can see the print button in the left menu bar. 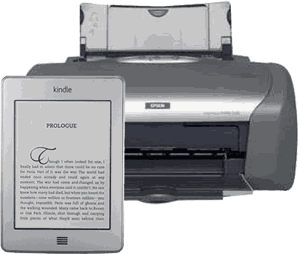 Click it as the image shows then you can print the eBook to paper book with the printer connected to your computer. Want to print document, webpages, emails in Kindle Fire? Read this post how to print from Kindle Fire. If you have some other genius ideas about how to print eBooks out, don't forget to share with us via comment and I will add it into the post with your name. And if this post helps you solve a problem, why not spend one second to click like and share it with your friends? What if I want to print to pdf one page and not print a hard copy. Will Epubor do that? The book I have in my Kindle library wont be affected corrected, it still will be in the original format? Will the software allow the whole book to be saved page by page as a pdf to be saved on my computer. I am looking at this software for purchasing a cookbook and saving specific recipes. Yes Epubor will do that for you. #1, Download the book via Kindle for PC. #2, Use Epubor Ultimate Converter to convert the book into a PDF file. #3, Open the PDF with Adobe Reader or Foxit Reader. #4, Go to the page you want to print, the rest job just like print a .doc file, you can choose how many pages you want to print out in the print settings. If have any thought, please contact me or leave another msg here. Would epub work for cousesmart textbooks? As long as the book is protected by Adobe DRM, you can use our program to handle it. Can I print from the kindle app on my mac book? If so, what directions should I follow? Just follow this post you can do it. As our Kindle DRM Removal has Mac version, and the Calibre also has the Mac version. So you can do it without difficulty. what is the registration code for a 30 day free trial?? You need not to input reg-code for a free trial. Will the software secretly upload a copy of the unprotected ebook? Our software will protect our customers' privacy and won't distribute or share your personal information with any individual or organization. What after the 30 days free-trial.how do i use it for further purposes ? what is the registration code after the 30 day free trial ?? After free trial ended, and if you like it, you can purchase it. Once finished buying, you will receive the license code. I need to remove drm from a .VBK file... there is a print limit (2 pages!!!). What can I do? What do you do in my case-amazon kindle on my android tablet ?